Where would you rather be, in a tower or in a dungeon? Well if you travel to Germany’s Rothenburg ob der Tauber, you can certainly try both. Rothenburg o.d.T. (not to be confused with numerous other Rothenburgs in Europe) is a quintessentially Bavarian town, with all the cobblestones, half-timbered houses, beer and sausages one would expect in this part of Germany. But more than that, it is a living museum of a glorious past. Rothenburg used to be a Free Imperial City of the Holy Roman Empire – meaning it had essentially broken away from any larger kingdoms or overlords and been given a charter to operate as an independent city state. This allowed for great prosperity to develop within the still-intact town walls, while much of the rest of Europe continued to wallow in the economic quagmire of feudalism. But all things must pass, and Rothenburg’s Golden Age had to come to an end. As with other well-preserved medieval towns (Bruges comes to mind), Rothenburg’s centuries-old economic collapse was the modern traveler’s gain. After narrowly averting total destruction during the 30 Years War, apparently due to the local mayor’s ability to down a lot of wine (I’ll save that story for another blog), Rothenburg kind of fell off the economic map of the German territories as trade routes shifted. So instead of undergoing a series of renovations to keep the town “modern”, the impoverished citizens had to settle with living in their medieval buildings in relative obscurity until the age of Romanticism in the mid 19th century started bringing in tourists looking for some romanticized ideal of medieval life. And they haven’t stopped coming since. 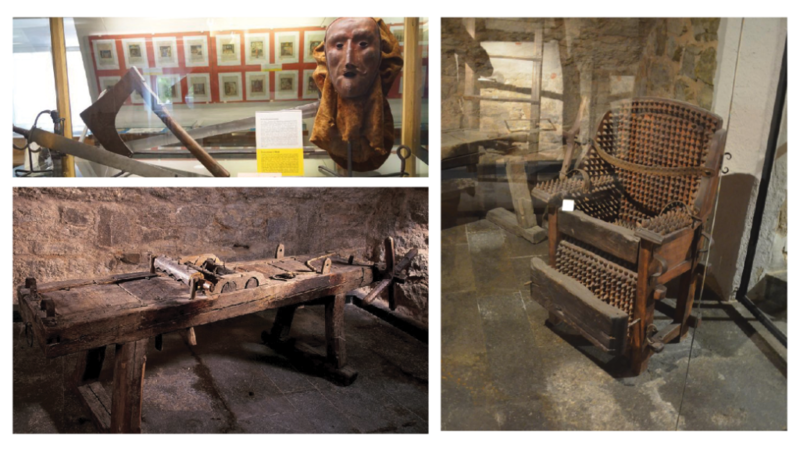 So now, when you visit Rothenburg, among other medieval/Bavarian activities, you can climb down the stairs to the dungeon in the Kriminal Museum and contemplate the many creative ways our ancestors came up with to torture, uh, our other ancestors. Or you can climb the Rathausturm (townhall tower) and squeeze through what is possibly the smallest door in Europe to access what is possibly the smallest balcony in Europe. But the views are grand! Me, I’d do both. Above: (TOWER) The white tower of the town hall does what a tower is supposed to do and towers over the city centre. From the top you can survey not only the whole town but the beautiful Bavarian countryside surrounding it. Below: (DUNGEON) The Kriminal Museum actually covers 4 floors and is the best collection of implements relating to the medieval justice system anywhere in Europe. But you get to start your tour in the dungeon. 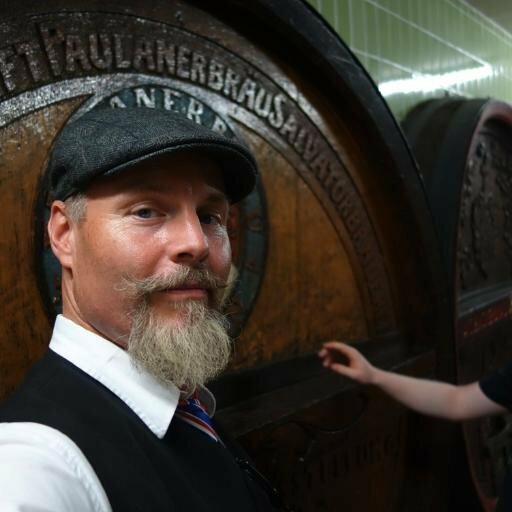 Rathausturm – Hours: 9:30 AM to 12:30 PM / 1:00 PM to 5:00 PM April to October. Closed in winter. Cost: A measly €2 (pay near the top). Go for it! Address – Just go to the Market Square and look up. Entrance to the tower, somewhat confusingly, is through the town hall door facing the Market Square. OneLife Tours is dedicated to the absolute best in European travel experiences for our small groups. 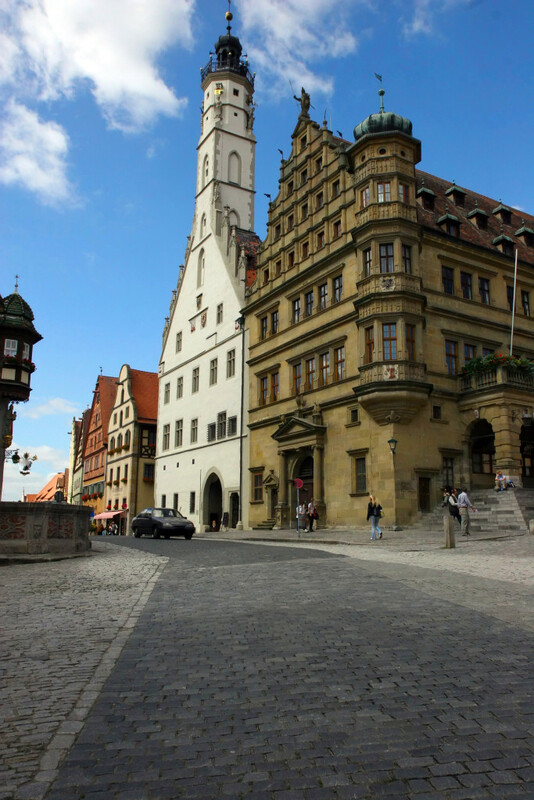 And Rothenburg ob der Tauber is a much-loved stop on our popular Grand Tour of Europe. Join us in dungeons and towers alike!